Since the summer I’ve cut back substantially from indulging in bread and carbs as well as sweets. For the most part I’m eating whole foods – lots of fresh fruit, vegetables, fish, whole grains and nuts. I’m not exactly sure how or why the transformation happened, maybe from all the biking I was doing, but I feel great, and as an added bonus, I’ve lost quite a bit of weight. That said, every time I walk into Whole Foods they always have samples of Lesley Stowe’s Raincoast Crisps that I can’t resist. If you’re not familiar with these, they’re tiny ultra thin crackers filled with nuts, dried fruit and oftentimes herbs. I never feel the least bit guilty having 1 or 2 or even 3 crisps. They’re flavorful, crunchy and not at all filling. 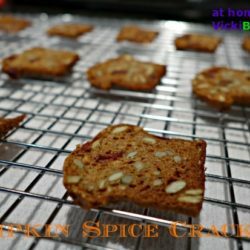 While shopping the other day I noticed they had a new holiday flavor – “Pumpkin Spice Crackers.” After sampling one, I decided to try and make some myself, it would be the perfect blog post, especially with the fall weather. It didn’t take long to find a recipe online for Lesley Stowe’s Raincoast Crisps by another blogger, Julie of DinnerWithJulie. Her recipe is for Rosemary, Raisin, Pecan Crisps. 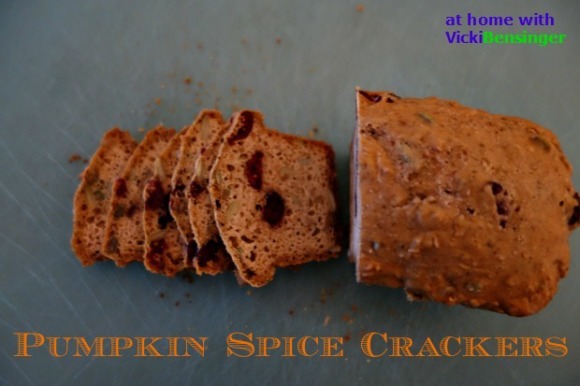 However, I wanted to try and duplicate the Pumpkin Spice Crackers I tried at Whole Foods. So using the base of her recipe. plus spice ingredients listed on the Raincoast Crisps box, I recreated my own. To my surprise they taste identical to the store bought. I knew I had to share these with you. These mini crisps are perfect as appetizer toasts, with cheese, spreads, dips or anything else you can think of to put on them. You might even want to package them up to give as a gift with some homemade jam or cheese. If you’re a fan of Lesley Stowe’s crackers or ultra thin crackers you’re going to love these. 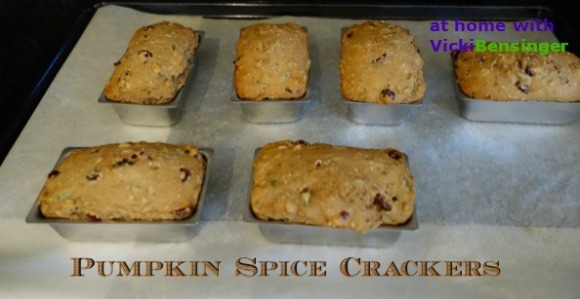 Here’s my recipe, I hope you’ll try them…..
Spray mini-loaf pans with non-stick coating and set on a parchment-lined baking sheet. In a large mixing bowl, whisk together the flour, baking soda, and salt. Whisk in the brown sugar, breaking up any big clumps. Pour buttermilk over flour mixture stirring with a spatula until combined and clear of any dry flour. Add cranberries (see Note), pumpkin seeds, sunflower seeds, flax seeds, sesame seeds and spices to the batter. Stir blending evenly throughout the batter. Divide batter between coated mini-loaf pans, about 3/4 full - tap or smooth surface. Place baking sheet with loaf pans in preheated oven. Bake 30 to 35 minutes, or until tops spring back to the touch, are golden-brown, and a toothpick inserted into the middle of the cakes comes out clean. Remove cakes from pans and place on a cooling rack. Allow to cool completely. Place in individual freezer bags or freezer container and set in freezer until frozen - several hours or over night. Loaves can be kept frozen for up to 3 months - if so wrap in foil before placing in a freezer bag or container. When ready to make the crisps, heat the oven to 300°F. Remove one loaf from the freezer and slice as thin as possible using a serrated knife, 1/8" thick. (I found it best to slice closest to the base of the knife, by the handle, for best leverage). Lay slices in a single layer, not touching, on a parchment-lined baking sheet. Use as many loaves as desired or save some for another time. Bake slices for 15 minutes. Flip, and continue baking for another 10 to 15 minutes. Crackers are done when deep in color (not burnt), feel dry to the touch, and are curled slightly at the edges. Crackers will crisp up as they cool. Remove from baking sheet to cooling rack and allow to cool completely. Crackers will keep in an airtight for several weeks. Note: I use Melissa's Dried Cranberries which are very plump and moist. However, if using another brand and you find them to be hard and dry, simply place the cranberries in a small bowl and cover with hot water. Allow to rest for 15 minutes to plump up. Drain before adding to batter. I can’t believe you made your own Raincoast crisps! (well, actually I do.) They look perfect!!! They’re so easy Liz. I searched online and someone had created a recipe for one of Lesley Stowe’s other flavors, her link is at the bottom of my post. I used the base of that recipe plus the ingredients that were on her holiday box (that I purchased) to recreate these. I was shocked – they tasted exactly the same. What’s even better is that I made up two batches and still have 5 more mini loaves in my freezer. Now when I want more all I have to do is take them out, slice and bake them. They’re delicious! You have to try them, especially if you’re already a fan. These look delicious. I will definitely try them. I think you’ll like them Sheryl! Wow, these look terrific! I’ve seen those at Whole Foods, but never even thought to make my own. You rule! 🙂 Thanks for a terrific recipe. I know I eat them all the time. For some reason when I walked in last week and tried them a light bulb went off in my head that said I have to make these. Who knew they’d be so, so easy. You have to try them! 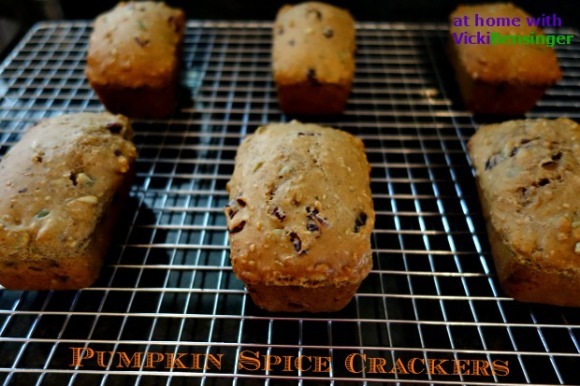 These are just like our twice baked bread slices here..they look awesome, Vicki. Right they’re just like when you make biscotti – twice baked only these you put in a mini bread pan whereas with biscotti you shaped the dough. I hope you’ll try them. I surprised myself when I discovered I really had all the ingredients on hand to make these. I’m sure they’d be perfect with my morning coffee. Trust me I pulled out a loaf from the freezer yesterday and my husband and I have already devoured them. I’m going to make a special dip to go with these so stay tune, it will be coming soon. I’ve made the Rainbow Crisps and they were wonderful. 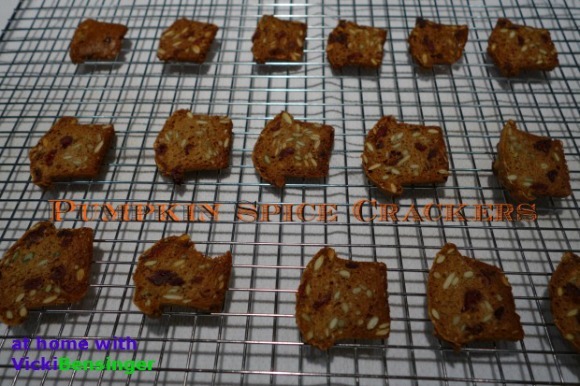 I love these pumpkin crisps for the fall and anything with nuts in it is a winner to me! I’ve never seen Rainbow Crisps. Are those the ones from Trader Joe’s? I’ll have to check those out. I thought these were different since they had all the flavors of fall in them. They’re so easy to make, i hope you’ll try them. I just bought some tiny loaf pans last week! If that isn’t a sign I should make these, I don’t know what is. 🙂 They look like a perfect snack. I am trying to cut down on the wheat too, it’s not that good for my digestion when it is hot. 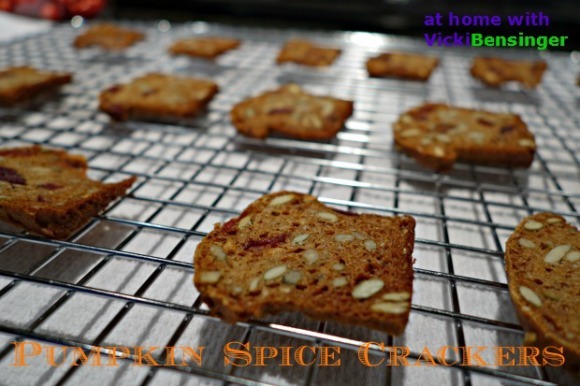 Vickie your crackers remind me of a recipe we did once back in college. I remember my batch was quite addictive. Not sure if I would still be able to find the recipe, anyhow I will be saving your recipe. Thanks! They do say great minds think alike though I’m not sure mine is so great. But it is funny that we posted something so similar this week. 🙂 I love these crackers, actually had a few for breakfast this morning! What a great way to make crackers! I’m definitely making these – how perfect for the holidays. Oh do I love these crackers! A must try! Thanks for sharing, Vicki! My wife tried those at home and they really tasted great. Thanks for this great recipy and good luck with your website. Lots of great stuff here :). I bet these would be heavenly with cheese and a cocktail. What a great nosh to end out the year. Wishing you a wonderful 2015! 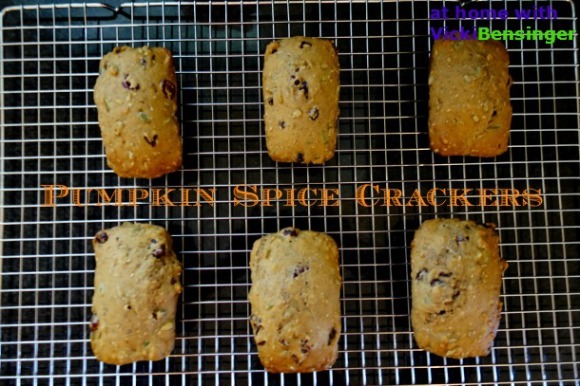 This is so easy to make and so yummy as well!! Omomomomom! !